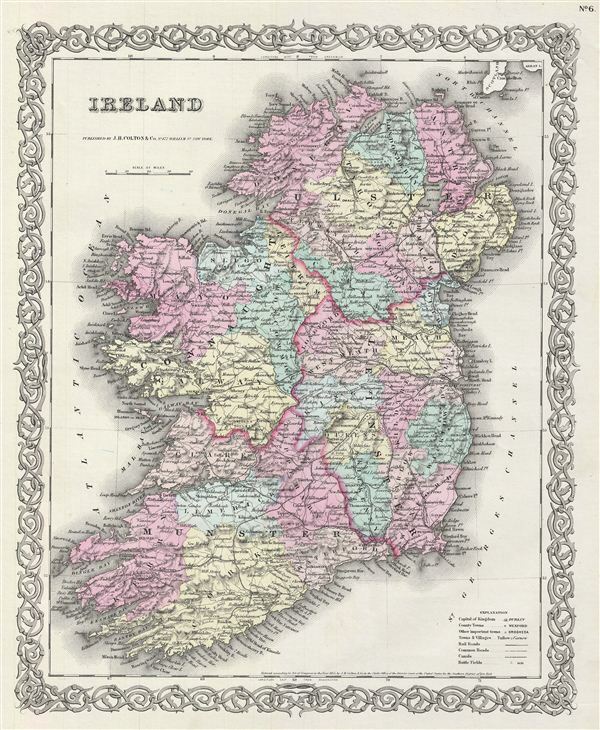 An excellent 1855 first edition example of Colton's map of Ireland. Like most of Colton's europe maps, this map was derived from an earlier wall map of the World produced by Colton and D. Griffing Johnson. The map covers the entire emerald Isle in full from Donegal to Cork. Ireland is divided into its four primary provinces, Munster, Ulster, Connaught and Leinster. During the 19th century, Ireland suffered a series of famines, the worst one being the Great Irish Famine, which lasted from 1845 – 1849 and killed about a million people. As a result Ireland experience a widespread exodus – mostly to the United States. By the end of the 19th century, almost 50% of immigrants into the United States were from Ireland. This map also identifies various cities, towns, forts, rivers, rapids, mountain passes, fords, and an assortment of additional topographical details. Colton's map is hand colored in pink, green, yellow and blue pastels to define national and regional boundaries. Surrounded by Colton's typical spiral motif border. Dated and copyrighted to J. H. Colton, 1855. Published from Colton's 172 William Street Office in New York City. Issued as page no. 6 in volume 2 of Colton's 1856 Atlas of the World. Rumsey 0149.073 (1856 edition). Phillips (Atlases) 816.